Proteins are the "workhorse" molecules of life Proteins mediate virtually all cellular functions. 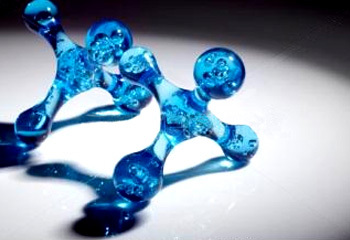 Of all the molecules found in living organisms, proteins are the most important. They are used to support the skeleton, control senses, move muscles, digest food, defend against infections and process emotions. How proteins are made in cells? Proteins play a profound role in proper cell function, thus affecting the entire organism. Proteins are the machines that make all living things function, from viruses to daffodils, spiders to sea lions, and everything in between. Our bodies are made up of more than ten trillion cells and each of these cells is responsible for a specific job. Every cell contains thousands of different proteins, which work together as tiny machines to run the cell. We can think of proteins as parts of a car engine – each part looks different, and they all do separate jobs to make the engine run. Proteins are the "workhorse" molecules of life, taking part in essentially every structure and activity of life. Proteins are necessary for virtually every activity in our body. They circulate in our blood, seep from our tissues, and grow in long strands out of our head. Our bodies are composed of millions of cells which are constantly being replaced and repaired. New cells are added all the time. Proteins are molecules made up of amino acids stuck together by peptide bonds and are vital for the growth, repair and maintenance of the body. Protein biosynthesis is the process by which biological cells generate new proteins. Protein biosynthesis is the process in which cells build proteins. The term is sometimes used to refer only to protein translation but more often it refers to a multi-step process, beginning with amino acid synthesis and transcription which are then used for translation. When the cell needs to make a certain protein, specialized machinery within the cell's nucleus reads the gene and then uses that information to produce a molecular message in the form of RNA, a molecule very similar to DNA. RNA then moves from the nucleus into the cytoplasm of the cell, where the cell 's protein –making machinery, the "ribosome" reads the message and produces a protein that exactly matches the specifications laid out in the gene. The protein then travels to the part of the cell where it is needed and begins to work. DNA is the code repository for the protein synthesis. Cells store and use coded information. The genetic information stored in DNA is used to direct the synthesis of the thousands of proteins that each cell requires. No factory on Earth is able to complete a flawless production process so rapidly and accurately. How come protein synthesis phenomenon is so accurate? How proteins are made in cells? How does the cell convert DNA into working proteins? Before going into the details of how genes direct protein synthesis, let 's step back and examine the complexity of protein synthesis and also let 's try to resolve all the mysteries of protein synthesis. Proteins, which have vital importance to the survival of living things, are produced by a flawless organization in the cell, whose complexity and regularity cannot be compared with any other production system. In this complex system, there is no room for the slightest error. A flaw arising at any stage is corrected immediately, due to a reliable control system. In this way the proteins that permit the living organism to survive are manufactured in exactly the right forms and locations, with no disruptions arising. Protein production work flawlessly together in the cells Cellular DNA contains instructions for building the various proteins the cell needs to survive. In order for a cell to manufacture these proteins, specific genes within its DNA must first be transcribed into molecules of mRNA; then, these transcripts must be translated into chains of amino acids, which later fold into fully functional proteins. During protein production, a great many proteins act together and all the components necessary for protein production work flawlessly together in the cells. There are approximately 80 ribosome proteins, 20 amino acid messenger molecules, over 40 RNA molecules, about a dozen helper enzymes and more than 100 enzymes that carry out the final processes,–a total of around 300 macromolecules–play a coordinated role in protein synthesis. This flawless production, which even a team of engineers would have trouble coordinating. In the event that a single one of those molecules fails, the entire production chain is ruined. This indicates that protein production is one of the irreducibly complex processes in living things. In an irreducibly complex system, if only one of its components is removed, then the entire structure is ruined. For example, if only one protein fails to emerge, that puts an end to production of new proteins. The existence of such a planned and communal consciousness is possible only in protein synthesis. Each gene encodes a unique protein that performs a specialized function in the cell. The genetic information stored in DNA is a living archive of instructions that cells use to accomplish the functions of life. "Are you ready to transcribe a DNA sequence and translate into a protein"? Let 's start reading the molecular mechanism involved in protein synthesis. 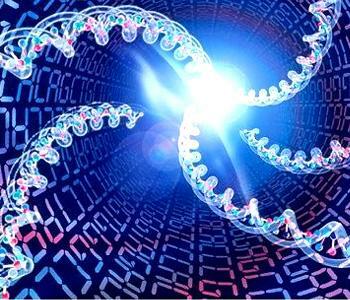 The DNA that makes up the human genome can be subdivided into information bytes called genes. Each gene encodes a unique protein that performs a specialized function in the cell. 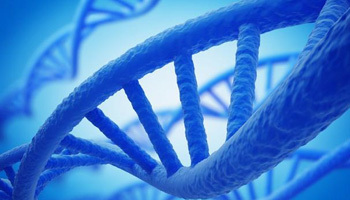 The human genome contains more than 25,000 genes. Cells use the two –step process of transcription and translation to read each gene and produce the string of amino acids that makes up a protein. The basic rules for translating a gene into a protein are laid out in the Universal Genetic Code. Let 's step into the details of protein synthesis. Genes provide the instructions for making specific proteins, but a single gene does not build a protein directly. The bridge between DNA and protein synthesis is the nucleic acid RNA. 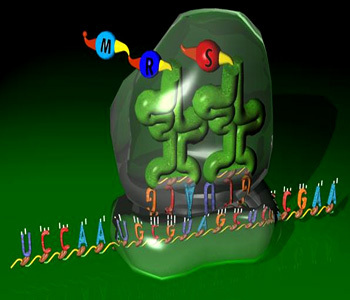 Genes program protein synthesis via genetic messages in the form of messenger RNA. Cells are governed by a molecular chain of command: DNA – – – RNA – – – protein. The RNA molecule is chemically similar to DNA, except that it contains ribose instead of deoxyribose as its sugar and has the nitrogenous base uracil rather than thymine. Thus, each nucleotide along a DNA strand has A, G, C, T as its base, and each nucleotide along an RNA strand has A, G, C, or U as its base. RNA molecule usually consists of a single strand. Role of ribosomes Ribosomes are complex particles that facilitate the orderly linking of amino acids into polypeptide chains. It is customary to describe the flow of information from gene to protein in linguistic terms because both nucleic acids and proteins are polymers with specific sequences of monomers that convey information, much as specific sequences of letters communicate information in a language like English. In DNA or RNA, the monomers are the four types of nucleotides, which differ in their nitrogenous bases. Genes are typically hundreds or thousands of nucleotides long, each gene having a specific sequence of nucleotides. Each polypeptide of a protein also has monomers arranged in a particular linear order (the protein's primary structure), but its monomers are amino acids. Thus, nucleic acids and proteins contain information written in two different chemical languages. The path from DNA to protein requires two major stages: transcription and translation. Flow of genetic information from gene to protein. The journey from gene to protein is complex and tightly controlled within each cell. It consists of two major steps: transcription and translation. 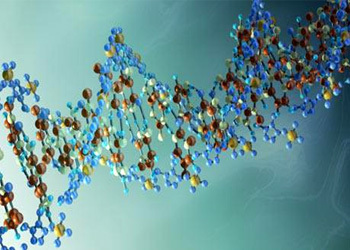 Together, transcription and translation are known as gene expression. 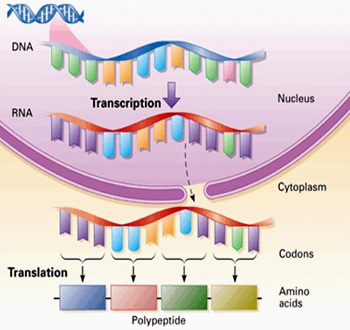 Transcription is the synthesis of RNA using information in the DNA. The two nucleic acids are written in different forms of the same language, and the information is simply transcribed, or "rewritten", from DNA to RNA. DNA strand serve as a template for assembling a complementary sequence of RNA nucleotides and for a protein –coding gene, the resulting RNA molecule is a faithful transcript of the gene's protein –building instructions. This type of RNA molecule is called messenger RNA (mRNA) because it carries a genetic message from the DNA to the protein –synthesizing machinery of the cell. DNA to Protein Transcription occurs in the nucleus, and mRNA is then transported to the cytoplasm, where translation occurs. Translation is the synthesis of a polypeptide using the information in the mRNA. During this stage, there is a change in language: The cell must translate the nucleotide sequence of an mRNA molecule into the amino acid sequence of a polypeptide. The sites of translation are ribosomes, complex particles that facilitate the orderly linking of amino acids into polypeptide chains. You might wonder why proteins couldn't simply be translated directly from DNA. There are evolutionary reasons for using an RNA intermediate. It provides protection for the DNA and its genetic information. As an analogy, when an architect designs a house, the original specifications (analogous to DNA) are not used by the construction workers at the site. Instead, they use copies of the originals, pristine and undamaged. RNA intermediate allows more copies of a protein to be made simultaneously, since many RNA transcripts can be made from one gene while each RNA transcript can be translated repeatedly. The basic mechanics of transcription and translation are similar for bacteria and eukaryotes, but there is an important difference in the flow of genetic information within the cells. Bacteria do not have nuclei, and their DNA is not separated by nuclear membranes from ribosomes and the other protein synthesizing equipment. In a eukaryotic cell, by contrast, the nuclear envelope separates transcription from translation in space and time. Transcription occurs in the nucleus, and mRNA is then transported to the cytoplasm, where translation occurs. 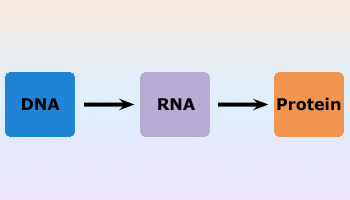 The transcription of a protein –coding eukaryotic gene results in pre –mRNA, and further processing yields the finished mRNA. Genetic code The genetic code is the set of rules by which information encoded within genetic material is translated into proteins by living cells. When biologists began to suspect that the instructions for protein synthesis were encoded in DNA, they recognized a problem: There are only four nucleotide bases to specify 20 amino acids. Thus, the genetic code cannot be a language like Chinese, where each written symbol corresponds to a single word. How many bases, then, correspond to an amino acid? If each nucleotide base were translated into an amino acid, only 4 of the 20 amino acids could be specified. Would a language of two –letter code words suffice? The base sequence AG, for example, could specify one amino acid, and GT could specify another. Since there are four bases, this would give us 16 (that is, 42) possible arrangements – still not enough to code for all 20 amino acids! Triplets of nucleotide bases are the smallest units of uniform length that can code for all the amino acids. If each arrangement of three consecutive bases specifies an amino acid, there can be 64 (that is, 43) possible code words – more than enough to specify all the amino acids. Experiments have verified that the flow of information from gene to protein is based on triplet codon. The genetic instructions for a polypeptide chain are written in the DNA as a series of non –overlapping, three – nucleotide words. For example, the base triplet AGT at a particular position along a DNA strand results in the placement of the amino acid serine at the corresponding position of the polypeptide to be produced. Ribosome is the structure where the proteins are synthesized. The mRNA interacts with a specialized complex called a ribosome, which “reads” the sequence of mRNA bases. Protein assembly continues until the ribosome encounters a “stop” codon (a sequence of three bases that does not code for an amino acid). Whenever the body needs any protein, a message expressing that need is transmitted to the DNA molecule in the nucleus of cells that will carry out that protein's production. Whenever a need for any protein arises in the body, various messenger proteins can locate the exact location where they have to go inside the darkness of the body and can transmit the message to the exact correct place and in the right form. The protein which establishes that communication reaches its location without becoming lost and without causing any harm to any part of the body. Thus, clearly every component shows a great awareness of its responsibilities. Structure of tRNA molecule that can read the triplet codon on mRNA sequence. Transfer ribonucleic acid (tRNA) is a type of RNA molecule that helps decode a messenger RNA (mRNA) sequence into a protein. The translation machinery resides within the cell in a specialized organelle called the ribosome. In eukaryotes, mature mRNA molecules must leave the nucleus and travel to the cytoplasm, where the ribosomes are located, where as in prokaryotic organisms, ribosomes can attach to mRNA while it is still being transcribed. 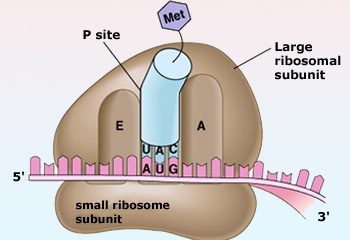 In all types of cells, the ribosome is composed of two subunits: the large (50S) subunit and the small (30S) subunit (S stands for svedberg unit which is a measure of sedimentation velocity and therefore, mass). Each subunit exists separately in the cytoplasm, but the two join together on the mRNA molecule. 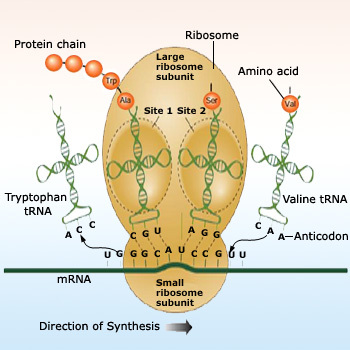 The ribosomal subunits contain proteins and specialized RNA molecules–specifically, ribosomal RNA (rRNA) and transfer RNA (tRNA). The tRNA molecules are adaptor molecules–they have one end that can read the triplet code in the mRNA through complementary base –pairing while the other end attaches to a specific amino acid. 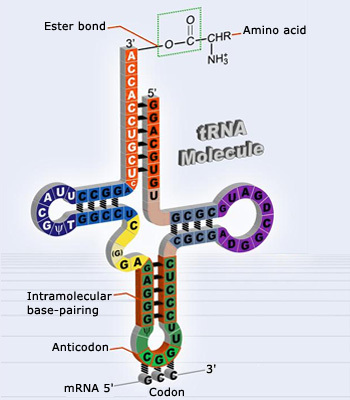 The idea that tRNA was an adaptor molecule was first proposed by Francis Crick, co –discoverer of DNA structure, who did much of the key work in deciphering the genetic code. Within the ribosome, the mRNA and aminoacyl –tRNA complexes are held together closely, which facilitates base –pairing. The rRNA catalyzes the attachment of each new amino acid to the growing chain. Initiation process starts with binding of tRNA to start codon. This phase of protein synthesis results in the assembly of a functionally competent ribosome in which an mRNA has been positioned correctly so that its start codon is positioned in the P (peptidyl) site and is paired with the initiator tRNA.. The translation of mRNA begins with the formation of a complex on the mRNA. Three initiation factor proteins (known as IF1, IF2, and IF3) bind to the small subunit of the ribosome to form a pre –initiation complex and then a methionine –carrying tRNA binds to the mRNA, near the AUG start codon, forming the initiation complex. Once the initiation complex is formed on the mRNA, the large ribosomal subunit binds to this complex, which causes the release of IFs (initiation factors). The large subunit of the ribosome has three sites at which tRNA molecules can bind. The A (amino acid) site is the location at which the aminoacyl –tRNA anticodon base pairs up with the mRNA codon, ensuring that correct amino acid is added to the growing polypeptide chain. The P (polypeptide) site is the location at which the amino acid is transferred from its tRNA to the growing polypeptide chain. Finally, the E (exit) site is the location at which the "empty" tRNA sits before being released back into the cytoplasm to bind another amino acid and repeat the process. The initiator methionine tRNA is the only aminoacyl –tRNA that can bind in the P site of the ribosome, and the A site is aligned with the second mRNA codon. The ribosome is thus ready to bind the second aminoacyl –tRNA at the A site, which will be joined to the initiator methionine by the first peptide bond. Elongating the Protein synthesis Process The Elongation phase of protein synthesis consists of a cyclic process whereby a new aminoacyl-tRNA is positioned in the ribosome, the amino acid is transferred to the C-terminus of the growing polypeptide chain, and the the whole assembly moves one position along the ribosome. The next phase in translation is known as the elongation phase. First, the ribosome moves along the mRNA in the 5' –to –3'direction, which requires the elongation factor G, in a process called translocation. The tRNA that corresponds to the second codon can then bind to the A site, a step that requires elongation factors (in E. coli, these are called EF –Tu and EF –Ts), as well as guanosine tri phosphate (GTP) as an energy source for the process. Upon binding of the tRNA –amino acid complex in the A site, GTP is cleaved to form guanosine di phosphate (GDP), then released along with EF –Tu to be recycled by EF –Ts for the next round. Peptide bonds between the now –adjacent first and second amino acids are formed through a peptidyl transferase activity. For many years, it was thought that an enzyme catalyzed this step, but recent evidence indicates that the transferase activity is a catalytic function of rRNA. After the peptide bond is formed, the ribosome shifts, or translocates, again, thus causing the tRNA to occupy the E site. The tRNA is then released to the cytoplasm to pick up another amino acid. In addition, the A site is now empty and ready to receive the tRNA for the next codon. This process is repeated until all the codons in the mRNA have been read by tRNA molecules, and the amino acids attached to the tRNAs have been linked together in the growing polypeptide chain in the appropriate order. At this point, translation must be terminated, and the nascent protein must be released from the mRNA and ribosome. 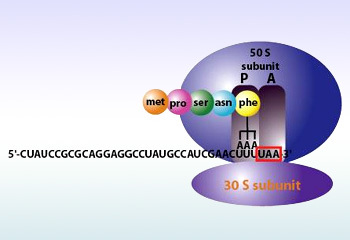 There are three termination codons that are employed at the end of a protein –coding sequence in mRNA: UAA, UAG, and UGA. No tRNAs recognize these codons. Thus, in the place of these tRNAs, one of several proteins, called release factors, binds and facilitates release of the mRNA from the ribosome and subsequent dissociation of the ribosome. Direction of protein synthesis. All mRNAs are read in the 5´ to 3´ direction, and polypeptide chains are synthesized from the amino to the carboxy terminus. The translation process is very similar in prokaryotes and eukaryotes. Although different elongation, initiation, and termination factors are used, the genetic code is generally identical. In bacteria, transcription and translation take place simultaneously, and mRNAs are relatively short –lived. In eukaryotes, however, mRNAs have highly variable half –lives, are subject to modifications, and must exit the nucleus to be translated; these multiple steps offer additional opportunities to regulate levels of protein production, and thereby fine –tune gene expression. Thus, if put together – Protein synthesis/Translation is the process by which a protein is synthesized from the information contained in a molecule of messenger RNA (mRNA). During translation, an mRNA sequence is read using the genetic code, which is a set of rules that defines how an mRNA sequence is to be translated into the 20 –letter code of amino acids, which are the building blocks of proteins. The genetic code is a set of three –letter combinations of nucleotides called codons, each of which corresponds with a specific amino acid or stop signal. Translation occurs in a structure called the ribosome, which is a factory for the synthesis of proteins. The ribosome has a small and a large subunit and is a complex molecule composed of several ribosomal RNA molecules and a number of proteins. 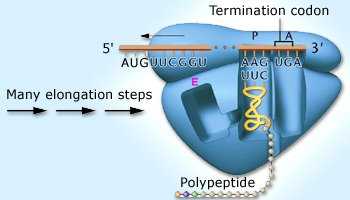 Termination of translation mechanism. The final phase of protein synthesis requires that the finished polypeptide chain be detached from a tRNA. This can only happen in response to the signal that a stop codon has been reached. After hydrolysis, the ribosome subunits dissociate. Translation of an mRNA molecule by the ribosome occurs in three stages: initiation, elongation, and termination. During initiation, the small ribosomal subunit binds to the start of the mRNA sequence. Then a transfer RNA (tRNA) molecule carrying the amino acid methionine binds to what is called the start codon of the mRNA sequence. 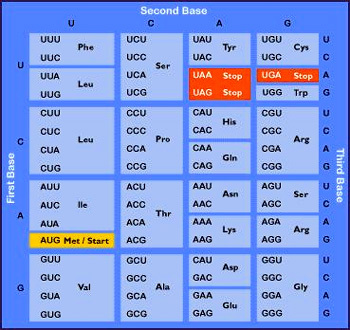 The start codon in all mRNA molecules has the sequence AUG and codes for methionine. Next, the large ribosomal subunit binds to form the complete initiation complex. During the elongation stage, the ribosome continues to translate each codon in turn. Each corresponding amino acid is added to the growing chain and linked via a bond called a peptide bond. Elongation continues until all of the codons are read. 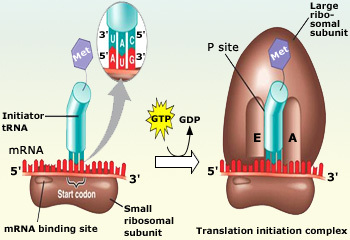 Lastly, termination occurs when the ribosome reaches a stop codon (UAA, UAG, and UGA). Since there are no tRNA molecules that can recognize these codons, the ribosome recognizes that translation is complete. The new protein is then released, and the translation complex comes apart.